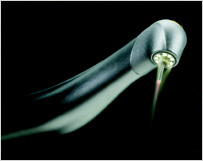 By visiting Dr. Ginnie Chen, you'll have the opportunity to experience a new and exciting technology...Laser Dentistry! Dental lasers are a family of instruments. During a dental laser treatment a laser device that transmits a highly concentrated beam of light is used to treat tooth decay, enamel, and gum tissue. Some lasers are used for surgery, some to cure restorative materials and enhance tooth bleaching, and others to remove tooth structure for elimination of disease and restoration - different lasers for different procedures. Common laser dentistry procedures include oral surgery or periodontal treatment (gum disease, gingivitis) often referred to as laser periodontics, cavity treatment, and teeth whitening. All lasers require eye protection. Safety glasses with special lenses will be provided. Family and guests in the dental operatory at the time of your laser treatment may also be asked to wear protective eyeglasses. Lasers do not make whining sounds or other annoying noises. You may experience the sound of a rush of air, since air suction is often used to keep the area cool and cleaner. You should be able to relax and be comfortable while the dental laser is in use. Depending on your treatment needs, your dentist may use the laser for a long period of time or possibly only for brief moments. However, even those procedures that require only a short period of laser usage benefit from the advantages of laser therapy.